1. 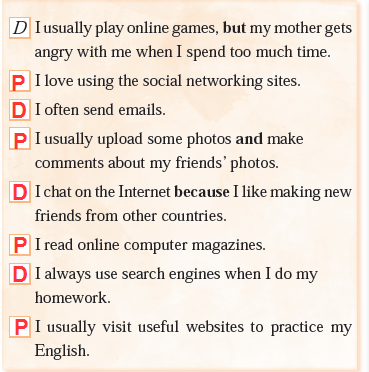 For what purposes do you use the Internet? Tick (✓) the boxes below. Then share them in the class. You can also say some other purposes of using the Internet. a sentence is not in the conversation. “but” and “because”. Then share it with your friends. I like playing online games but I don't like buying tickets. Because it can be dangerous for me to do it.